(CNN) -- Cristiano Ronaldo has moved to end speculation about his Manchester United future by dropping a clear hint that he intends to stay at Old Trafford. Ronaldo trains with his teammates ahead of the Champions League final against Barcelona. The World Player of the Year has been consistently linked with a switch to Real Madrid and looked set for a move to the Bernabeu last summer before pledging his future to United where he is contracted until 2012. With Florentino Perez pledging to build a new superteam as part of his campaign to be elected Real Madrid club president, inevitably talk has turned to a new bid to sign the Portuguese star. 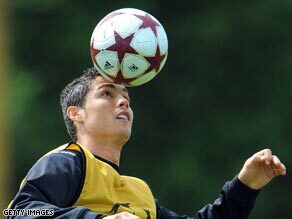 But in an interview with Spanish radio station Atena 3, Ronaldo insisted he has thoughts only for his current club. "At the moment I am only thinking about the Champions League final independently of what will happen to me or my team-mates next season," he said. "I am sure Perez would create an incredible team at Madrid but at the moment I am at United and I don't care about what happens there. "I only care about what will happen next season at Manchester United." Real Madrid also issued a statement on their official Web site on Friday to deny reports that they were set to sign Ronaldo. "Real Madrid wishes to deny news that have appeared in several media regarding an alleged signing of Manchester United's Cristiano Ronaldo. "No pre-agreement exists between the club and the player, his agent or Manchester United," they said in a statement. "As everyone knows, Real Madrid tried to sign the player last summer, but Manchester United firmly stated he would not be transferred," the statement added. Ronaldo has returned to the form which won him football's top individual honor, scoring superb goals against Porto and Arsenal to propel United to the Champions League final against Barcelona. Ronaldo admits United will have to be at their best to retain the trophy won on penalties against Chelsea last year. "It will be very difficult to do it again, because Barcelona have a good team, great players and a great coach," he said. "The two teams are very good, they play very well and they have dream squads." Many are claiming the key to victory for either side will rest on the performance of Ronaldo and Barcelona's Lionel Messi in Rome, but the United winger is dismissing such talk. "It's a battle of teams," he said. "Without my team I won't win and neither will Messi without his team-mates. It's clear that we are the two best teams in Europe. It will be the match every fan dreamed about." United are bidding to add the Champions League trophy to the Premier League and League Cup crowns won in England and the Club World Cup. Barcelona are eyeing an historic treble having claimed the Spanish Primera and Spanish Cup.